Every morning I wake up and the first thing I do is grab my phone to read the daily headlines from the local paper. Last Saturday, I read about a horse show that was going on that morning and I thought to myself, "Why not?" So, Trey and I loaded up the girls and we headed to the Cleveland County Fairgrounds. At first sight, Layla and Jenna had the deer in headlights look. Then again, so did the horses. The girls talked the big talk and acted like they wanted to get a closer look. But, Jenna quickly realized she was wrong. Layla, on the other hand, LOVED the horses! Jenna: "Whoa, horsey! Back it up!" One of the nice families asked the girls if they wanted to pet their horse. Go ahead, Layla, give it a whirl! Layla: "Ooh, I like him!" How about you, Jenna? Can you pet the horse? Or at least poke him? How about a closer look at his face? Jenna: "Too close! Too close!" I'm telling you, Layla couldn't get enough! Layla: "Yes, Daddy, this is it. This is the one I wanna take home." I was really surprised at how nervous Jenna was around the horses. She's usually very outgoing and curious. To tell you the truth, I actually enjoyed her reaction because then I got to have moments like this with her. She's usually too busy to cuddle, so I was loving this! Once we made the rounds and saw all the horses, we headed across the lot to cruise the farmer's market. With MDO starting in a few days, Layla and Jenna had their very first "Meet the Teacher Night" last Thursday and they were super excited. After Daddy got home from work, we all piled in the car and headed to our church to meet Teacher Pat. The girls were a little shy at first, but once they spotted the horses they made themselves right at home! Teacher Pat has 6 kids of her own ranging from age 30 to 50 and she's been teaching MDO for years on end. To say she is experienced is an understatement. Friends who have had children in Teacher Pat's class say she is A-MAZING, so we are thrilled to be in her class this year. Just before we left, Teacher Pat gave Layla a little treat. Jenna: "Don't forget about me, Teacher Pat!" I think the girls will have a great year in Teacher Pat's class! Yes, that's chocolate on Jenna's face...Teacher Pat really knows the way to a kid's heart! 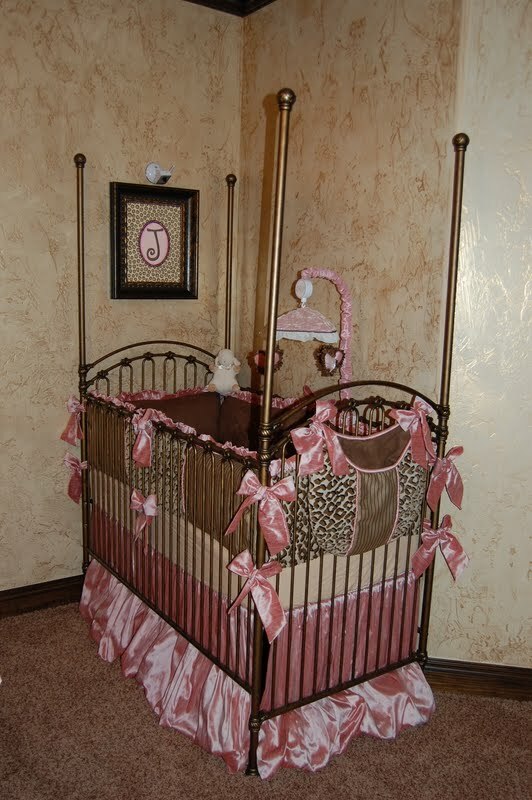 As promised, here are some pictures of Layla and Jenna's nursery. The nursery was a LONG project to complete, but in my defense, not only was I on bed rest for the last three months of the pregnancy, we also moved 45 days before the babies were born! I was able to order furniture, choose fabrics, design bedding and window treatments, and purchase decorative items through online shopping, emails, phone calls, and home visits! Thank goodness for modern technology and the help of family and friends! Most of these pictures were taken long ago when the crib mattresses were still at their highest setting and the mobiles were attached, but some are more recent. This is where sweet Jenna lays her head at night. Gotta have a place for precious Layla's head too! Lots of people ask me if they share a crib. They did for the first 12 weeks when they were sleeping in our room, but then they became a little too wild! 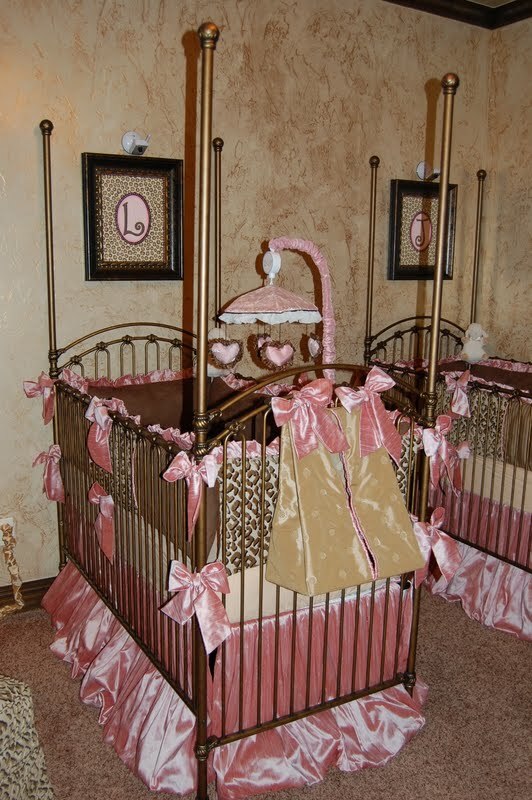 When we transitioned them to the nursery, we figured it was a good time to separate them into their own cozy cribs. Here's a close up of the bedding detail. All the fabrics were purchased from Kern's Interiors in Norman, but the bedding and window treatment were made at Room to Dream in OKC. The cribs are also from Room to Dream. I couldn't have done it without the help of my friends from both of these fine establishments...so here's a shout out to those fabulous ladies! The mobiles are from Babies R Us, which I was supposed to have recovered to match their bedding...oops, never got that done. Oh well, they work. 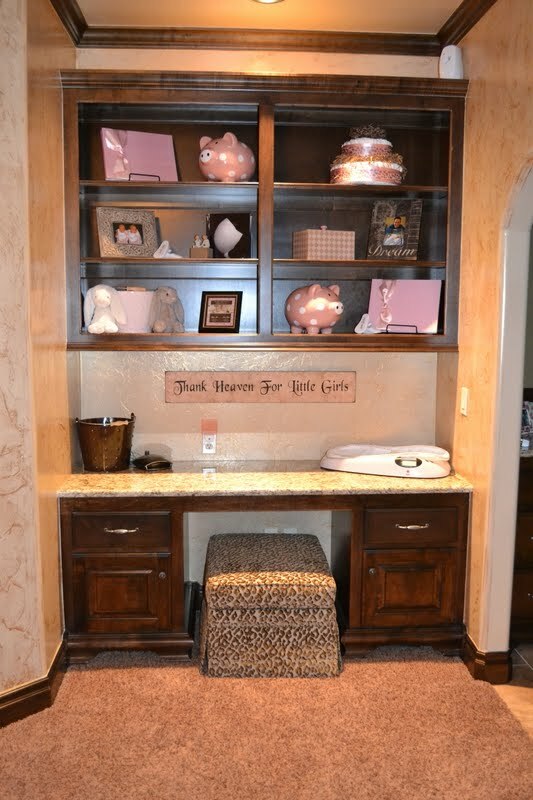 The changing table/dresser was a custom order from Room to Dream and barely made it here before the babies were born. I found the mirror at In Your Dreams in Norman a long, long time ago. It used to hang in the dining room of our old house, but didn't work in our new house. I was so glad it fit well in the nursery. See the blank wall next to the mirror? I have since added this cute little shelf. It needed something. The chair, lamp, and side table are from Kern's as well. Seriously, go see them if you need furniture or home accessories! Here it is all coming together. Don't you just love the furry prams? Layla and Jenna used to wear these when we would take walks in the fall and winter months last year. They kept the girls nice and toasty! The memory board next to the closet is where Layla and Jenna hang the announcements of their newest friends. It sure is getting full! This is a built in desk that I'm sure they'll fight over one day. For now, it serves as a place for all their special things...their baby books, personalized crib shoes (a gift from Trey's coworker), their birth announcement, a photo book of my maternity pictures, and one of the diaper cakes from our church (which was delivered with a meal). We actually got two diaper cakes and two meals...I guess you hit the jackpot when you have twins! The baby scale on the desktop doesn't get much use anymore, but was really handy in the early preemie days to keep track of their weight. Whew! 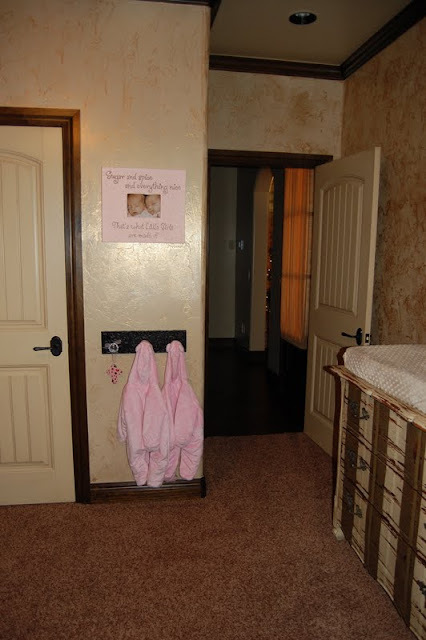 I can't believe I haven't posted pictures of their nursery until now. I'm certainly glad to have it documented before it's time to turn it into a "big girl" room! Time flies, ya know! Instead of cutting everything into bite size pieces, we have been letting Layla and Jenna experiment with some whole foods in hopes that they will learn how to bite into things. Layla gets a kick out of whole foods. That's right, Layla, take a bite. Or, I guess you can just shove the whole thing in your mouth, Jenna. Why is Layla fully dressed and Jenna in nothing but a diaper? I have no idea. After I set up Layla and Jenna's new play kitchen the other day, I sat back and admired just how darn cute it was. I then got to thinking that I have never taken pictures of their playroom to post on the blog. I certainly want to document this so they can one day look back and see how lucky they were! Isn't their kitchen darling! The pictures on the wall are framed prints from Eric Carle books. I've always loved his books and so do the girls. 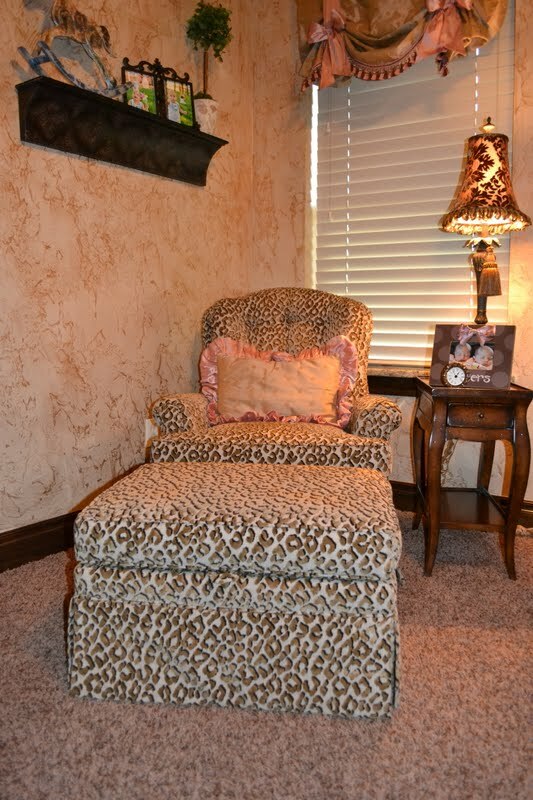 The personalized chairs provide hours of entertainment. The cutest thing ever is when the girls sit in them and read a book. However, they are usually found standing in them and climbing all over them! The smartest purchase I have made for this room is the magnetic board. Now the girls can play with all their magnetic toys on here instead of scratching up my stainless steel refrigerator! The paper lanterns hanging from the ceiling add a nice pop. A bonus feature is the girls can practice their colors as we name them all. It's super fun to turn off the lights and turn on the lanterns...although, that's a Daddy activity because Mommy can't reach them without a stool! Layla and Jenna have so much fun finding and kissing themselves in the kid-level mirror (hence all the smudges). The Nap Nannies that are propped up next to the TV bring back lots of memories. That's where the girls would lay to take a bottle when they were just teeny babies. Now, we pull them out when it's movie time. They simply can't watch a movie without their Nap Nannies! The video camera that sits just in front of the TV is super convenient for when I need to step out of the room. Next to the TV is a docked iPod which is perfect for jamming out to kiddie tunes! As you can see, we had to take the door off the hinges because the girls kept shutting themselves in. The gate is a perfect solution for a playroom door. Through the arched doorway, I have a makeshift changing table set up. It's literally a 2x4 folding table, but it sure beats getting up and going to the nursery every time a diaper needs to be changed! You might think that by having a playroom the rest of my house is toy-free! WRONG! Nobody ever told me that kids come with so much stuff...and we're only a year and a half in! Soon to come...nursery pictures (since I'm realizing I've never posted any of those either)! This is Jenna's signature "ooh, I like what I'm seeing" walk. Of course, she goes straight for the phone...she loves talking on the phone! Meanwhile, Layla is still in the nursery bawling her little heart out. I asked Jenna to go get her sissy so she could show her their new toy. Jenna ran to the nursery, phone in hand, and ran back to the playroom. Layla followed. As soon as she spots me, she runs toward me for comfort. But, as soon as she spots the kitchen in her peripheral, she makes a hard right to go check it out. This was the scene for the next two hours! Jenna: "I'm so happy, I can hardly contain myself!" Checking out their new pots...nice and shiny like the ones in Mommy's kitchen! Layla's cooking up some banana soup. Jenna's not too sure about her recipe. Jenna is ready to get that hot pan out of the oven! Next up from Chef Layla...orange flambe! Jenna: "I'm taking orders, folks!" Here's Jenna cooking in her high heels. Layla is concentrating really hard on her next concoction. Jenna: "Can I get you something to drink?" Jenna: "Who's gonna wash all these dishes?" Jenna: "I better check on sissy's queso...don't want it to boil over!" 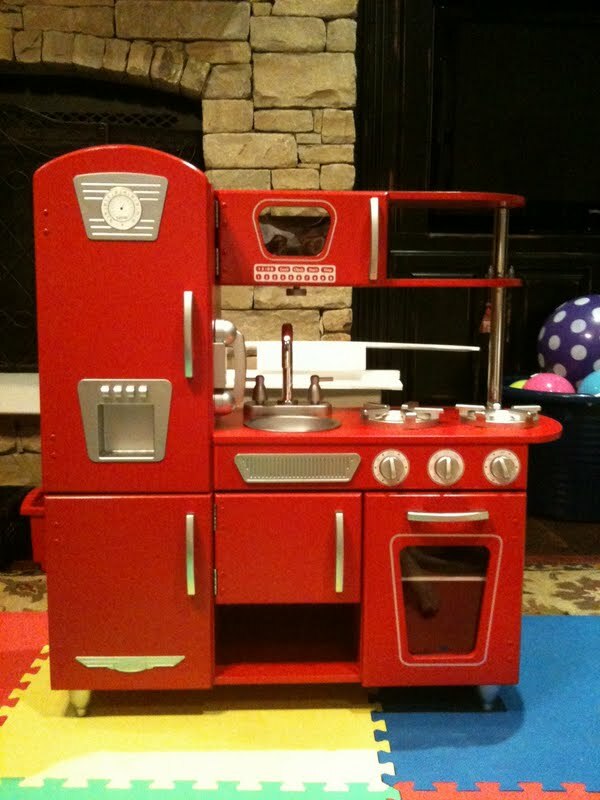 Layla: "Thank you Grandma, this kitchen is awesome! Here's Jenna..."
Jenna: "I LOVE IT, GRANDMA!" Layla: "This is the best day of my life!" Thank you so much, Grandma. We can't wait for you to come over and play with us! I Heart My Nieces and Nephews!